I have designed and independently taught Introduction to Sociology, Research Methods, Sociology of the Family, and Criminology. Please contact me to request syllabi. I have also been an instructor for the McNair Scholars Program at Temple University, and Project L/Earn and the Paul Robeson Leadership Institute at Rutgers University. These three programs provide underrepresented and first-generation undergraduates with intensive research experiences. I have also worked with student-athletes on writing courses and study skills. 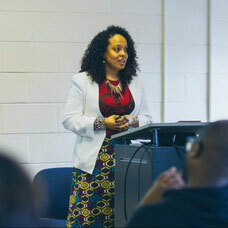 My other teaching interests include Social Policy, Inequality, Culture and Cognition, Race and Ethnic Relations, and Social Justice in the Social Sciences.